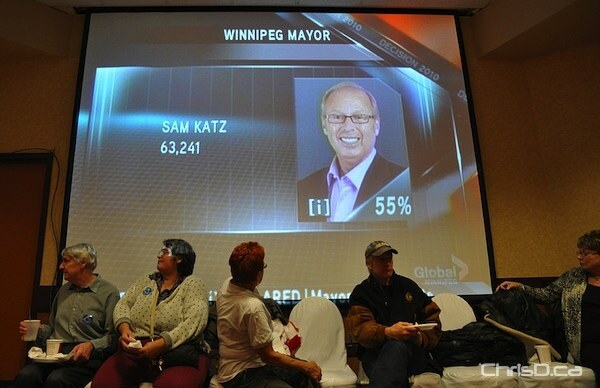 Judy Wasylycia-Leis accepted defeat Wednesday night at Canad Inns Polo Park, losing out to incumbent Mayor Sam Katz, who was re-elected for a third term. Wasylycia-Leis took a gamble last April, quitting her job in Ottawa to take a run at the city’s top seat. Days after returning to Winnipeg, she announced her candidacy on May 3 at a rally at The Forks. It’s been a battle for Wasylycia-Leis over the months, often exchanging jabs with Katz over policy and other issues. After kicking her campaign off in the spring, both front-running candidates were rather quiet, with no campaign announcements or news conferences for weeks until later in the summer. Her first commitment had to do with the touchy topic of rapid transit, which she vowed to finish, slamming her main opponent for wasting time and money on the project. She also touted Winnipeg’s New Flyer Industries over a Quebec company to handle the contract for manufacturing the streetcars locally. One of the bigger issues during Wasylycia-Leis’ campaign was the Veolia water contract debacle, which came up numerous times as she criticized Katz for holding the details of the 30-year deal private. It became a regular line during her news conferences to get rid of secrecy and backroom deal-making at City Hall if elected. Wasylycia-Leis also made the move of announcing to increase property taxes by 2% for every year she would have been in office, but she also won a lot of support form residents fed up with Winnipeg’s crumbling roads and infrastructure. The increase would have seen the average taxpayer pay about $27 more a year, bringing in $8 million annually for the city. Wasylycia-Leis’ support base appeared to be strong, receiving the backing of the NDP and residents living in Winnipeg’s North End, the area affected by last Saturday’s violent shootings. Her stance on crime wasn’t as strong as Katz’s, though, vowing to give ex-gang members jobs with the City of Winnipeg. Often heard saying to get at the “root causes” of crime, she also came out pledging to increase police resources, and staff at community centres to get inner-city youth off the streets. While addressing the crowd Wednesday night, Wasylycia-Leis thanked supporters for being part of a “grassroots movement” and putting in endless volunteer hours. She acknowledged having called Katz to congratulate him on his victory.